Emmeline Illustration: The Lavender Blue Dress Picture Book Launch! Last week saw the launch of The Lavender Blue Dress, my newest picture book with Aidan Moffat and Cargo Publishing. 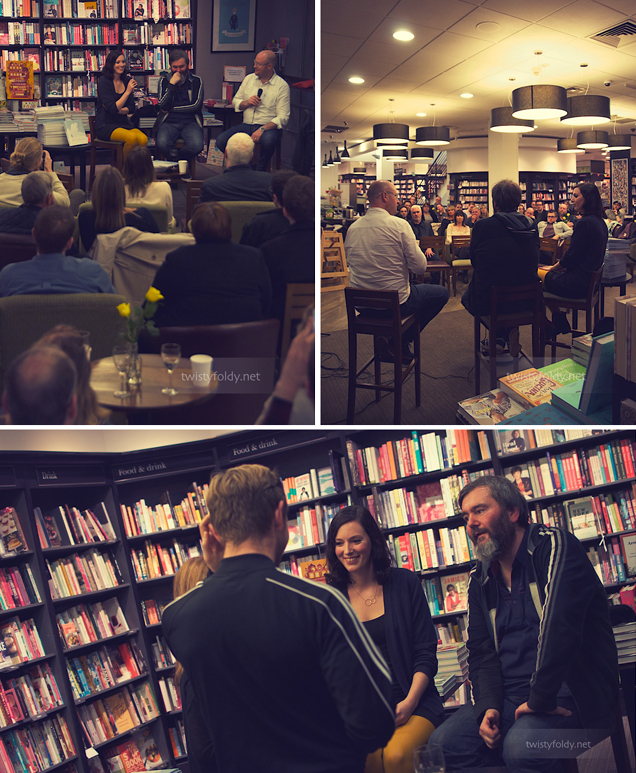 To celebrate the release on October 10th, I headed up to Glasgow for the big launch event at Waterstones Argyle Street. Aidan's a brilliant musician (you might recognise him from Arab Strap), and he played a few songs before I joined him onstage with Cargo's Murray Buchanan for a Q&A about the making of The Lavender Blue Dress, and a book signing session. The crowd was absolutely packed, and I was genuinely shaking with nervousness before the Q&A (I'm not quite used to public speaking!). According to the audience I pulled it off though, and answered some great questions from Murray on the making of The Lavender Blue Dress and how the project got started. It surprised a lot of people that Aidan and I had only first met just before the event, it's definitely an odd modern world where you can work with someone on such a big, soulful project and only meet after it's completed! But it's also very refreshing to be able to collaborate with people all over the world so easily. After the grown-up's event on Friday, we had a kid-friendly (and slightly chaotic!) event on Saturday chaired by the lovely Diane Buchanan. Again, the space was packed, and Aidan read the book to excited youngsters. We brought back the 'design your own dress for Mabel' sheets, and it was fantastic to see the kids engaged in the story and creating such beautiful dress designs! It was so humbling to have received such support for the book, and I can honestly say that the launch was the absolute highlight of my career so far. It was definitely a personal hurdle for me to jump into the public realm with my work, I'm often quite shy, but it was such a joy to meet so many people touched by something I've helped create. Huge thankyous to Aidan, Murray, Diane, Waterstones and all the amazing people at Cargo Publishing for making the event so great! Thanks as well to Andrew Jolly and Michael Gallacher for the event photos. Keep your eyes peeled for my post about my other adventures in Glasgow, up later this week!